NTR Biopic Digital Rights acquired by Amazon Prime Video: The online digital streaming websites are becoming popular and the number of audiences who are watching films on such platforms is growing every day. On this note, the Tollywood movies are getting sold for high prices. Amazon Prime video has already got the digital rights of ‘Rangasthalam’, ‘Bharath Ane Nenu’, ‘Mahanati’. 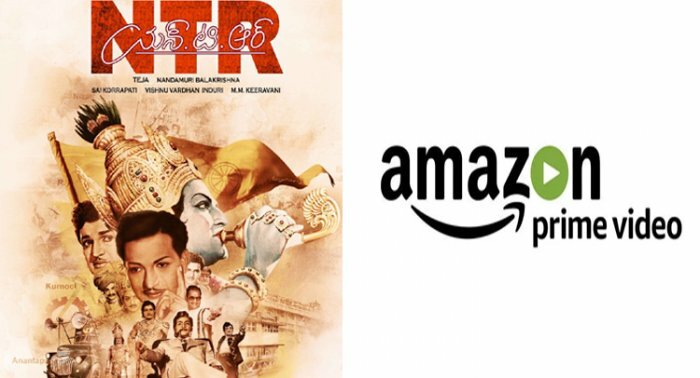 Now, the Amazon Prime video has finally achieved the rights on the legendary actor turned politician NTR Biopic as well. If the buzz is to be believed, NTR Biopic Digital Rights acquired by Amazon Prime Video for 25 crores and the movie parts which is slated for release on January 9th and February 7th will be available NTR Biopic full movie online on Amazon Prime video from March 1st. The expectations have been sky high on this movie and the trailer of the film has increased the expectations. The audience are confident that Nandamuri Balakrishna as NTR under the direction of Krish is definitely going to reach the expectations.